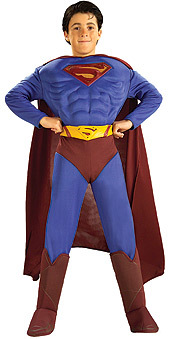 This bang up to the minute Superman Returns costume will ensure your little one will be the envy of all his friends. It comes complete with muscle chest jumpsuit with attached boot tops, cape and molded belt. All you need do is get your barber to give him a side parting, and he'll be all set to save the world. Available in child size small.